Nonprofits are constantly looking for ways to improve the way they market and fundraise for their next initiative. From their webpages to their email marketing, they must whip up creative fundraising ideas and content to excite supporters and get them involved. To spur some inspiration, here are three organizations that nail fundraising on three different fronts: the peer-to-peer campaign, email content, and nonprofit event. Included are takeaways for you to adopt and refine for your own initiatives. All Hands Volunteers addresses immediate and long-term needs of communities affected by natural disasters. By engaging volunteers, partner organizations, and local communities, the organization brings the power of volunteerism to the places that need it most. One of these places is Nepal. 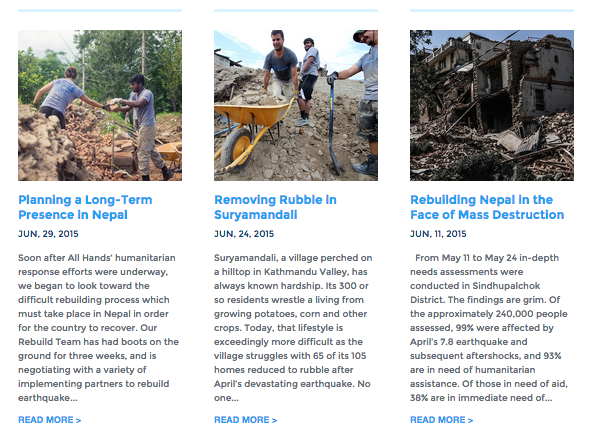 In the wake of the recent earthquake, All Hands launched Project Nepal, a peer-to-peer campaign funding relief efforts in the area. The organization created an awesome webpage detailing this campaign. …and another to illustrate the organization’s solution. 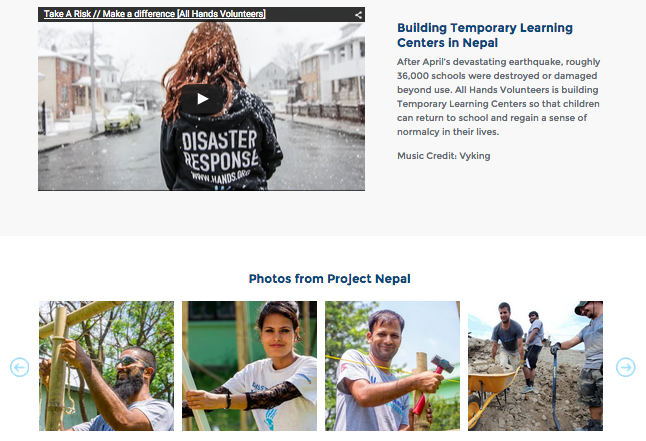 The organization also includes compelling video and photos from the field, capturing volunteers in action. As a bonus, the page also links out to regular blog updates from the field. These articles, complete with image headers to attract eyeballs, build transparency and credibility as they document the organization’s work and convey a sense of progress to supporters. Create an awesome webpage or microsite specifically for your major campaigns – Alongside your text, feature powerful impact photos and videos to evoke an emotional response. Whip up graphics to convey key facts or statistics about your cause. This visual information is easy to digest and immediately draws people into your campaign. 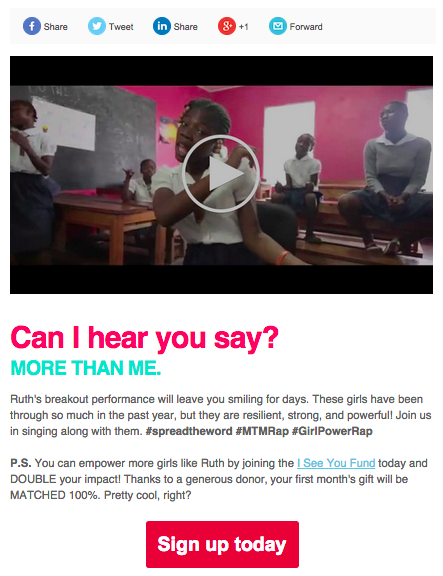 More Than Me is dedicated to providing education and opportunity to vulnerable girls in Liberia. Through classroom education, healthcare, and social services, the organization keeps girls off the street and empowers them to transform their own lives. One way they engage their audience is by crafting excellent emails. Their messages often feature compelling visual content, particularly videos. In this email, for instance, the organization created an ultra engaging rap video, starring one of the girls impacted by their programs. After capturing readers’ interest, the email then promotes More Than Me’s recurring giving program. They also mention a donation matching opportunity for new monthly donors. With an engaging video, a bold call to action, and clean, straightforward email design, the organization’s well-crafted message does not fail to inspire. Use videos in your emails – Including a video in your email doesn’t just capture readers’ interest; it can increase their chances of clicking through. Wistia, a video hosting and analytics company, found that including videos in their emails increased click-through rates by 300 percent. And don’t be afraid to get creative. An unconventional, delightful video can do wonders for engagement. Keep your email design simple and easy to read – Supporters can decide whether your email is worth reading from just one glance. Use headers, bold text, bullet points, and high-contrast call to action buttons to make your content scannable. Based in Cincinnati, Ohio, Episcopal Retirement Homes (ERH) is dedicated to improving the lives of older adults through innovative senior living communities and in-home and community-based services. They also offer affordable housing options for low-income seniors. While lots of nonprofit events are time-honored, standard affairs, ERH knows how to liven things up with a unique fundraiser. Take their “Over the Edge 4 Elders” event, for example. You wouldn’t immediately associate a group of seniors with climbing down a high-rise building, but ERH certainly does. 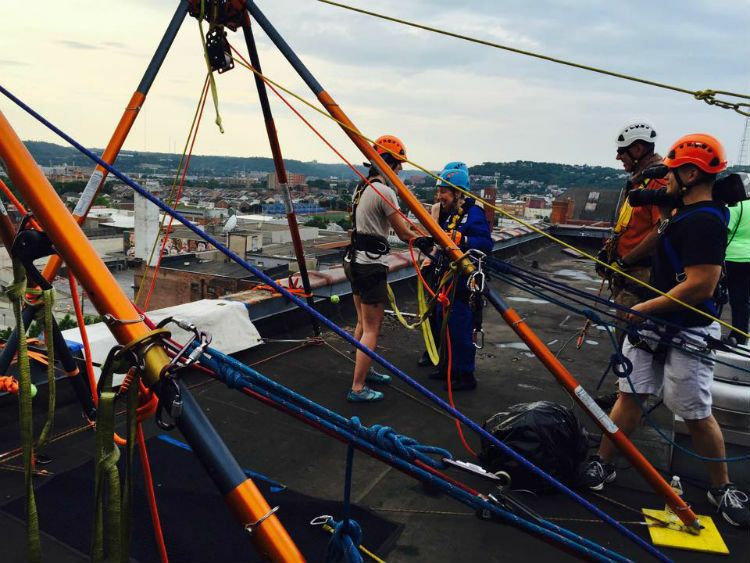 To support low-income senior housing, the event gave “Edgers”—participants who raised a minimum of $1,000—the opportunity to rappel down the side of a 10-story building. In fact, one of the Edgers was a 94-year-old senior. It’s no surprise this creative fundraising idea drummed up tons of engagement and excitement. The event was a major success, hitting its goal of $95,000. There are no substitutes for boldness or creativity – Jog your creative juices and do something out of the box. Doing something bold and exciting pumps up both donors and fundraisers, and naturally gets them involved. Peer-to-peer fundraising is for everyone – No matter what age, every supporter can be an effective fundraiser for your organization. You just need to provide the right tools and encouragement, such as helping them set up their fundraising pages or providing email templates for easy messaging. Every aspect of your fundraising can benefit from a creative lift. Whether it’s your peer-to-peer fundraising campaign, email content, or fundraising events, adapt these ideas to engage supporters in innovative ways.